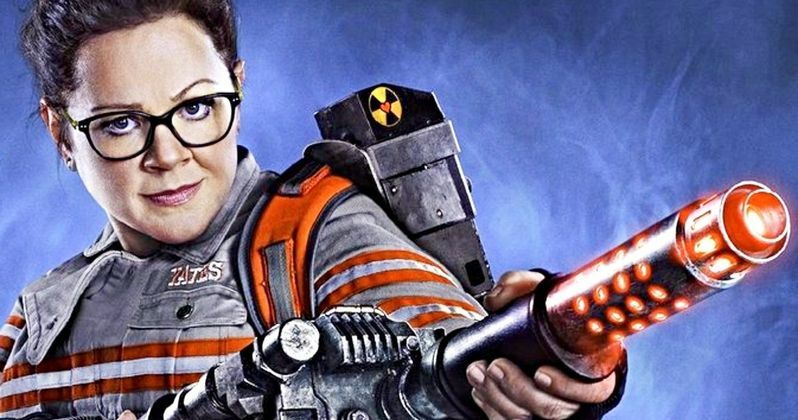 Melissa McCarthy says that she is "all for" Jason Reitman's upcoming Ghostbusters 3. The movie is taking the 2016 reboot, which McCarthy starred in, and forgetting that it ever happened. The all-female reboot was not well-received when it hit theaters, though audiences are okay with it now, giving the movie a 74% Fresh Rating on Rotten Tomatoes. Now, there are some fans of the 2016 reboot that believe Reitman is wrong to completely ignore the movie with the highly anticipated sequel. Melissa McCarthy is not a fan that fits into the negative category. The actress says that she has no problem with Jason Reitman's comments on taking the franchise back to fans, which he contends were misconstrued. McCarthy revealed that she has talked to Reitman and had nothing but good things to say about him and Ghostbusters 3. She explains. "I'm for anybody who's making movies. I talked to Jason about it, he's just always had this idea, and his goes back to the world where the guys did exist and I'm like, 'I want to see that.' I'm all for it. I say like, 'Tell the story.' I think there's a million stories to be told. He's a really, really good filmmaker and a really good storyteller, so I will be there buying my ticket." Fellow Ghostbusters costar Leslie Jones had a much different take on the subject when Ghostbusters 3 was first announced. Jones went off on social media about the sequel, stating that it is "so insulting," and that the movie insinuates like her and her female co-stars "don't count." Jones also called the decision to make the movie a "d*ck move." Jones was able to drum up quite a bit of support for her feelings on social media. Jason Reitman ran into some controversy last week when he said that he was taking the Ghostbusters franchise back for the fans, while stating that he wasn't making a "Juno" movie for the franchise. Many believed that he was taking aim directly at the all-female reboot with his comments. Reitman later apologized for his comments and said that he loves the 2016 reboot and that he was not talking trash on the movie in any way, shape, or form. Jason Reitman might be in for some more controversy in the future if the original cast from the franchise doesn't show up in Ghostbusters 3 in a role more substantial than a cameo. So far, it looks like the movie is set to star four young teenagers, which could see the same backlash that the all-female version had in 2016. Regardless, Reitman is happy with his idea and Melissa McCarthy backs it. Who knows, many we'll see the all-female cast make a cameo in the movie once it hits theaters. You can check out the interview with McCarthy over at Entertainment Tonight.